Identifying Potential Leaders is a brief overview of the process of selecting the right people for the right positions. In other words, to identify potential leaders, you need to know what they look like. There is something more important and scarce than ability. It is the ability to identify potential ability. Also, you need to select the right people for the right positions. Ask yourself: what is needed? Who are the people here who are available? Who is able? Who is willing? Who gets things done? 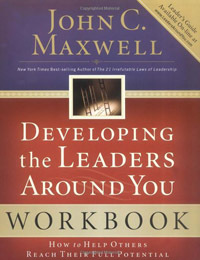 Maxwell calls this the list of the Five A's: Assessment of needs, Assets on hand, Ability of candidates, Attitude of candidates and Accomplishments of candidates. To select the right person or potential leaders for certain positions, you need to know what you are looking for. The following ten leadership qualities are a good place start. Character is number one. Serious character flaws will eventually make a leader ineffective. Qualities that make up good character include honesty, integrity, self-discipline, teachability, dependability, perseverance, conscientiousness and a very strong work ethic. You can tell much about people's ability to lead others by checking out how well they manage their own lives. Leadership is influence. Leaders must know where they are going and they must be able to persuade others to go with them. A positive attitude is one of the most valuable assets a potential leader can bring to a ministry. People who have a positive attitude are able to go places where others cannot. These people do things that others cannot and these people are not restricted by self-imposed limitations. To put it bluntly, leaders without people skills will soon have no followers. People skills involve concern for others, an ability to understand others and an ability to interact with others. People have skills and abilities. Leaders recognize those skills and abilities when assessing someone for a leadership role. Poet Archibald MacLeish once said, "There is only one thing more painful than learning from experience, and that is not learning from experience." Leaders who learn from their experience develop successful track records over time. If you are not a confidence leader, then people will not follow you. In fact, it is confidence that usually attracts people to you. Generally speaking, confidence is a characteristic of a positive attitude. Confident leaders are able to empower others. They instill within others confidence in themselves. Leaders are self-disciplined. They are in control and they take responsibility for their actions. Leaders who have self-discipline have identified goals and have plans in place to achieve those goals. Leaders must have the ability to communication effectively. Effective communication builds confidence in the people around you. Never underestimate the importance of effective communication. Status Quo is Latin for "the mess we're in." Raymond Smith of the Bell Atlantic Corporation once said, "Taking the safe road, doing your job, and not making waves may not get you fired (right away, at least) but it sure wont' do much for your career or your company over the long haul. We're not dumb. We know that administrators are easy to find and cheap to keep. Leaders - risk takers - are in very short supply. And ones with vision are pure gold." Donna Harrison said, "Great leaders are never satisfied with current levels of performance. they constantly strive for higher and higher levels of achievement." John Maxwell added, "They move beyond the status quo themselves and they ask the same of those around them." For more information about this subject, click on identifying potential leaders.